Design is a lot of things, not all of them at the same time. When we’re creating a space where purpose and efficiency factor just as hight on the list of priorities as fashion and style (think kitchens, bathrooms and playrooms) then design is practical. When the sky is the limit and we have all the budget that we need to make a space as amazing as it possibly can be (think designing someone else’s house - sometimes) then design is fashionable. But whatever design is being at any given point, one thing that it should always be is fun. That’s why as whatever our level of involvement with design - be it as professional designers, home decorators or design-lovers in general - we should be careful not to take ourselves too seriously. Which we sometimes do, especially when it comes to modern design. With all of the white wall interiors, amazing furniture pieces and angular designs, it’s easy to wind up with spaces that dazzle but that still have no real color, no pop per say. That’s fine for a space that’s only meant to be on display, but a home needs to feel warm and inviting. Which is why, many times, even if we’ve managed to design a pitch-perfect modern space, we need to ask ourselves a few questions. The first is how can we warm things up; where are the opportunities to infuse some life into our ultra-modern spaces? Well there is one pretty surefire way to bring some that livable sense of approachability to your modern space without sacrificing any of the beauty, style or personality of your room, and that - is to go a little bit less modern. By mixing some mid-century modern pieces into the design, modern interiors can stop being so stuffy, and start feeling like fun again. Now, I hear what you’re thinking, “Mid-century modern and modern are not the same thing.” You’re absolutely right. But there are some very creative new sites out there on the web, such as Article.com, that are taking a colorful new look at some mid-century classics that are the perfect way to liven up a space that’s maybe gotten a little too modern. So here’s three super-simple yet very effective ways that you can use mid-century modern style to your modern home. For anyone who may not be familiar with the term, the mid-century modern movement is so named because it happened to take place during the middle of the 20th century - roughly between the early 30s and the mid 60s - though of course for much of that time it was simply known as modern design. It gained the mid-century moniker some time in the mid-50s and has more or less kept it ever since. The style that the descriptor is used to define specialized in pieces of furniture that were more organic in shape and form while still remaining very minimal in nature due to the lack of ornate details when compared to pieces from still older eras. As a design trend, mid-century modern was rooted in the growth and development of the American middle-class during these decades, as architectural design began to focus on urban development with furniture design intended to meet the needs of the new homeowners of the times. And while those times have certainly changed, the mid-century period produced several furniture designs that are still considered classics, many of which can still fit well into a modern space. Among its many beautiful features, modern design is known largely for the straight-edged, streamlined approach that gives it its clean, minimalist aesthetic. In fact, one of the things that makes modern room design and mid-century furnishings such a good match is that both strive for a fairly minimalist, decidedly non-ostentatious look. One of the first things that mid-century furniture can do for a modern space, however, is to break up some of those straight lines with the more organic shapes that it favors. Many mid-century pieces sport curved lines and/or rounded edges, both of which can add some much needed personality to a room. The room above actually has several mid-century elements that take the modern look of the space in a different direction. Most notably, the slight curve offered by the sofa changes the spatial relationship of every other large furniture piece in the space, turning what would otherwise be just another white couch into a visual focal point. In addition to the sharp-corners and squared off lines seen in many of the furniture pieces we have in a lot of modern interiors today, many spaces featuring a modern design aesthetic also display a distinct lack of color in their environments. Neutral palettes rule the modern room, from the ever-classic black and white to various shades of gray, brown and beige. And while these palettes can be incredibly soothing when mixed with the right design choices, this often leads to a space with that can feel cold or sterile to some. So when you realize that that’s what has happened in your room, that’s the time to look to your mid-century modern pieces to bring in the heat. Even when designing the most modern of interiors, don’t be afraid to build the room around a pink sofa. The room setting featured here is stylish and sophisticated at the same time. The sofa is the wow factor in the room, and everything else around it is neutral tones with the gray rug and the walnut accent pieces which help to balance the high energy of the sofa - making g charismatic and intriguing rather than overbearing and out of place. I his room, the mid-century pieces are made from solid woods like walnut and cherry, and the angled legs and rounded corners of these pieces soften the overall look of the room by adding in just a few much needed curves and angles. In this room we have another great example of what a colorful mid-century piece can do for a neutral-heavy, modern color palette. With beige making the largest statements on the floor and walls, and warm wood tones connecting the wall trim and coffee table, this amazing shade of green has the perfect backdrop against which to really shine, while bringing together the similar shades of both the indoor plant and outdoor trees to help make the area around the space as much a part of the deer as the area within it. Color and mid-century modern design have gone hand in hand since since the earliest days of the period when designers like Alexander Girard, Ray & Charles Eames, and Eero Saarinen were the arbiters of interior style and the architects of the mid-century era. Color can feel like a big commitment, especially in places where it’s time and/or budget consuming to change it or on pieces of furniture that you expect to keep for a significant amount of time. Thats why when we’re planning out an interior space many of us often find ourselves shying away from the blue sofa or the pink chair (to say nothing of the colorful walls). But even though the commitment can be intimidating, the fact of the matter is that when the space that we’re designing is intended to have minimal design elements and simple furniture pieces, color becomes more important than ever. 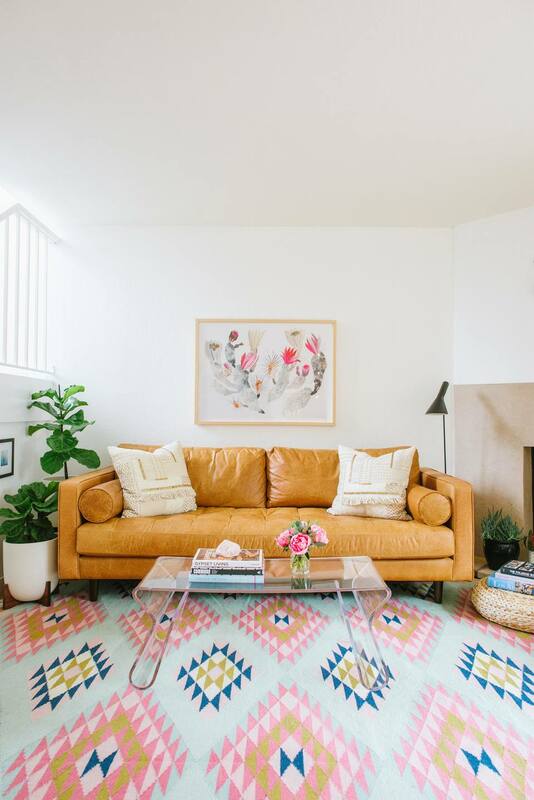 When selecting a bright color sofa for your room that will still give you a modern look, plan to select accessories with a more neutral color palette to keep it simple instead of becoming something more boho. Bring in colors like white and shades of gray paired with materials like marble and solid walnut so that the show stopper remains the colorful sofa, and everything else simply accentuates it. Even if you do want to go the generally safer route by sticking with a gray or cream colored sofa, the lines of most mid-century furniture pieces will make a huge impact on your space. If you're not ready to fully commit to adding in a ton of mid-century elements to your room, that’s totally understandable. After all, at a certain point it will stop being a modern room and become a mid-century space. So instead of filling the space with mid-century style, select one furniture piece to act as as the show stopper in the room. We’ve seen the iconic Eames Lounge chair used over and over again in modern interiors, not only because it is typically seen as a timeless classic that is always in style, but because it is perfectly suited for the role of being the mid-century eye-catcher in an otherwise completely modern room. Finally, if you know that you plan to keep your furniture all modern, but are still looking for a way to soften the look of the space to die it just a little added livability, another route to think about is to focus on some of the larger accessories like lighting and rugs to be the ones that carry your mid-century flair. Lighting like the Ceto Lamps work effortlessly into a modern interior. They add a touch of something special to a modern design scheme with their metallic color palette and texture in the lighting. So no matter what modern interior your working with you can always use a few little mid-century accents to spruce it up.